How PAHs Travel In the atmosphere, tiny aerosol particles can form a hardened-sap-like shield around the toxic particles, encapsulating them and trapping these toxics, thus providing a mechanistic explanation for their observed atmospheric persistence. The glassy shell gives the toxic payload protection from chemical oxidants that would normally break them down. This allows the particles to be transported much greater distances than previously thought. Researchers at PNNL and their collaborators treated these toxic particles in this new way in their models, and simulations now agree much more closely to observations of these substances around the world. Graphic by Nathan Johnson at PNNL. Enlarge Image. 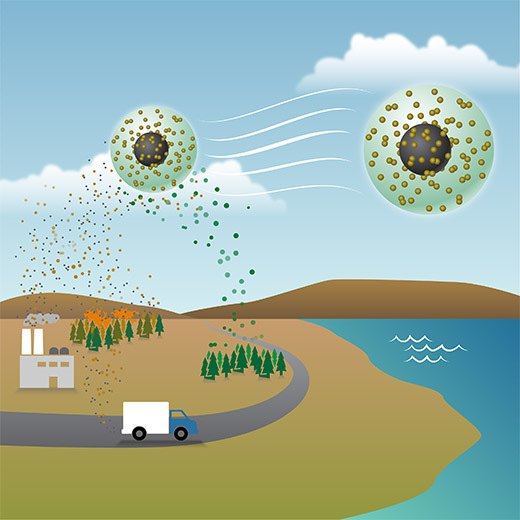 Combining state-of-the-art atmospheric modeling with the latest measurement-based findings, researchers at Pacific Northwest National Laboratory found that toxic particles can last longer and travel much farther than previous models predicted. These toxic bits are a class of persistent organic pollutants called polycyclic aromatic hydrocarbons, a.k.a. PAHs, which are harmful to human health and ecosystems. Previously, models assumed these hostile compounds would chemically degrade within a few hours in the atmosphere. But the models did not match measurements of PAHs taken in more than 300 urban and rural settings around the globe. 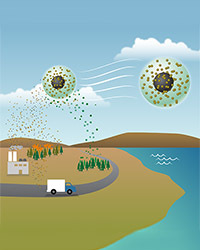 The organic aerosol particles that coat the toxic hitchhikers are wafted into the atmosphere through emissions from trees (like those that produce the smell of pine trees), and burning biomass and fossil fuel to form a semi-solid sap-like casing surrounding and protecting the particle's payload from breaking down in the atmosphere. The new insights indicate an estimate of global lung cancer risk from these pollutants four times higher than previously thought. The work was published in the Proceedings of the National Academy of Sciences. Why it Matters: Pollutants from fossil fuel burning, forest fires and biofuel consumption include a mix of chemicals and organic particles. Some of these particles-PAHs-appear on the United Nation's list of persistent organic pollutants where they are regulated as air pollution. In the United States, the Environmental Protection Agency has identified several PAHs as cancer-causing agents. Previously, scientists assumed that PAHs degraded in the atmosphere, so that's how they were represented in the models. However, when they compared the models to the amount of PAH that is actually measured in the environment, the numbers didn't add up. Methods: To solve this mystery, researchers led by Dr. Manish Shrivastava explored the discrepancy between the high amounts measured in the atmosphere and the model predictions. They changed the models to match the most current understanding of how particles react and persist. Scientists' understanding of aerosols has changed in the last five years. Recent experiments led by PNNL coauthor Dr. Alla Zelenyuk show that, depending on the conditions, the aerosol coatings can actually be quite viscous, that is, thick and sticky. When the atmosphere is cool and dry, the coating becomes more like hardened sap, trapping chemicals such as PAHs. Shielded by the coating, these PAHs can survive long distances, taking their harmful health effects to locations far from their origin. To find out if including the shielding of PAHs by viscous aerosols would improve global atmosphere models, the scientists used laboratory experiments to develop a new way of representing PAHs in a global model. Then they ran the model to simulate PAH concentrations from 2008 to 2010. They compared the simulation results to data from 69 rural sites and 294 urban sites worldwide. To look more closely at how far the PAHs can travel while riding shielded on a viscous aerosol, the researchers compared the model's numbers to PAH concentrations measured at the top of Mount Bachelor by coauthor Dr. Staci Simonich of Oregon State University, Corvallis. Research suggests these aerosols might come all the way from the other side of the Pacific Ocean. The team found the predictions with the new shielded model of PAHs came in at the same value that Simonich measured on the mountain-four times higher than the previous model, which was considerably off the mark. These predictions from models that considered shielded PAHs were far more accurate than previous predictions which included unshielded pollutants. To see an overall view of this long-distance travel, the team compared the old and new models on a world map. Zooming in on sources in particular regions allowed them to look at how far the protected PAHs could travel. In all cases, the shielded PAHs traveled across oceans and continents, whereas in the previous version they barely moved from their country of origin. "We developed and implemented new modeling approaches based on laboratory measurements to include shielding of toxics by organic aerosols in a global atmosphere model that resulted in large improvements of model predictions," said PNNL scientist Dr. Manish Shrivastava. "This work brings together theory, lab experiments and field observations to show how viscous organic aerosols can largely elevate global human exposure to toxins by shielding them from chemical degradation in the atmosphere." What's Next? "We don't yet know what the implications of more PAH oxidation products over the tropics are for future human or environmental health risk assessments. We need to better understand how shielded PAHs might vary depending on the complexity of the aerosol composition, atmospheric chemical aging of particles, temperature, and relative humidity," said Shrivastava. Sponsor: This research was supported by the Laboratory Directed Research and Development Program at Pacific Northwest National Laboratory; the National Institutes of Health; the National Institute of Environmental Health Sciences; and National Science Foundation. A.Z. was supported by the U.S. Department of Energy (DOE), Office of Science, Office of Basic Energy Sciences. Facilities: EMSL, the Environmental Molecular Science Laboratory, a DOE Office of Science user facility sponsored by DOE's Office of Biological and Environmental Research and located at PNNL and the core facilities of RECETOX Research Infrastructure, funded by the Ministry of Education, Youth and Sports of the Czech Republic. The PNNL Institutional Computing program and EMSL provided computational resources for the model simulations. Research Team: Manish Shrivastava, Silja Lou, Alla Zelenyuk, Richard C. Easter, Richard Corley, Brian D. Thrall, Philip J. Rasch, Jerome D. Fast, PNNL; Staci L. Massey Simonich, Oregon State University; Huizhong Shen, Georgia Institute of Technology; and Shu Tao, Peking University, China. Related links: Oregon State University news release, "Globe-trotting pollutants raise some cancer risks four times higher than predicted." In one sentence: Combining global modeling, measurements-based findings about toxic aerosol particles, and global lung cancer risk data, scientists found that PAH particles last longer and travel further than previously thought, leading to higher global lung cancer risk.